Writing to church leaders and educators, Ellen White declared that the all-important issue in Adventist education is the conversion of the student.1 While there have been studies, such as the CognitiveGenesis research,2 which have examined the academic performance of students in Adventist schools, this article will focus on two key outcomes: accession and retention—joining the Adventist Church and remaining in the denomination. So what do we know about access and retention, and the role of Seventh-day Adventist education? In short, there is a consistent and important relationship between attending an Adventist school and the likelihood that a child or youth will join the Adventist Church and then choose to remain a member. We’ll take a look at the evidence. In the biblical model, conversion is expressed through baptism.3 Baptism, in turn, is a public statement of one’s desire to formally join the church. Is there support for the role of Adventist education in accession to the church? 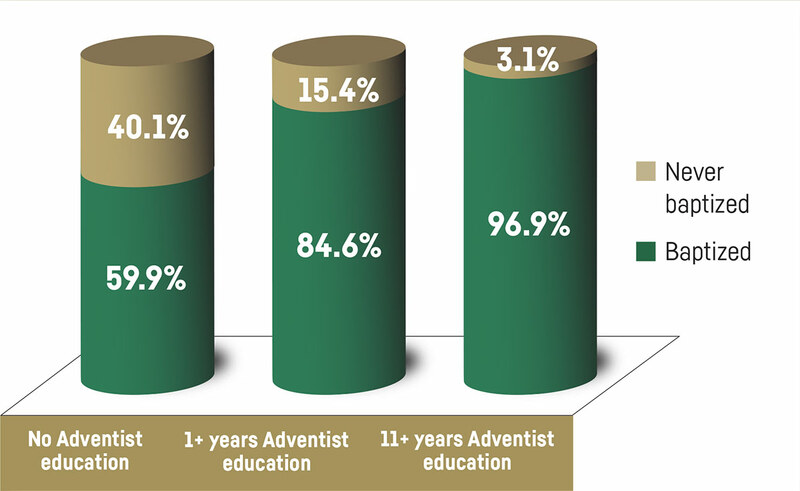 Adventist education is the longest and largest evangelistic event held by the Adventist Church. It is also one of the most effective. Depending on the country and the educational system, the duration of a school day can range from five to nine hours, and a school year can range from 160 to 260 days.4 An individual student could attend an Adventist school from a single year to perhaps 16 years or more. At minimum, if a student attends an Adventist school for just a single year, this represents an evangelistic opportunity of at least 800 hours. To use evangelistic terminology, this equates to a person attending an evangelistic series two hours per night for 400 nights. If a student, however, continues in Adventist education from 1st grade through university studies, the evangelistic potential could increase to more than 37,000 hours. In Adventist education, 5,705 evangelistic sites specialize in children 5-12 years old, with 51,965 evangelists and 1,188,910 young people attending each day. Also, 2,336 evangelistic sites focus on adolescents 13-16 years old, with 36,711 evangelists and 583,946 in attendance. For youth and young adults, there are 167 evangelistic venues, with 14,103 evangelists and 142,530 attending. 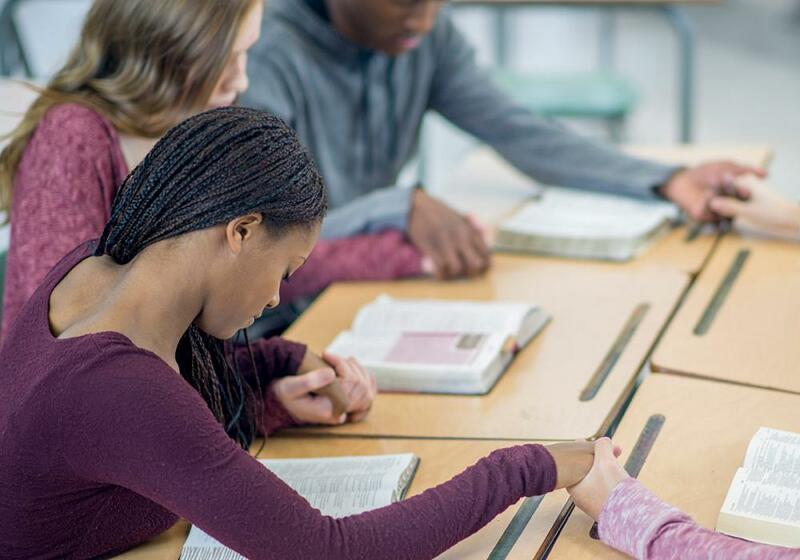 All told, Adventist education represents more than 8,000 evangelistic sites, with more than 100,000 evangelists involved and nearly 2 million in attendance each day.5 Certainly, it is the largest evangelistic endeavor of the church. Is it effective? Each year for the past 10 years, there have been at least 30,000 and in some years, more than 50,000 students in Adventist schools baptized during the school year, primarily in culminating events such as a Week of Prayer. The total for the 2006-2015 period was 427,313 baptisms.6 To look at it another way, this is equivalent to a typical-size conference being established each year through the evangelistic ministry of Adventist education. While only a few studies have compared attendance at Adventist schools with the baptismal rate of children from Adventist families, the ones that have examined this connection concluded that Adventist education does make a significant difference in terms of children and youth joining the church. A 1990 study, for example, analyzed 844 children and youth from Adventist families in the Southern Union Conference of the North American Division.7 Of those children and youth who had no Adventist education, 40.1 percent were never baptized. 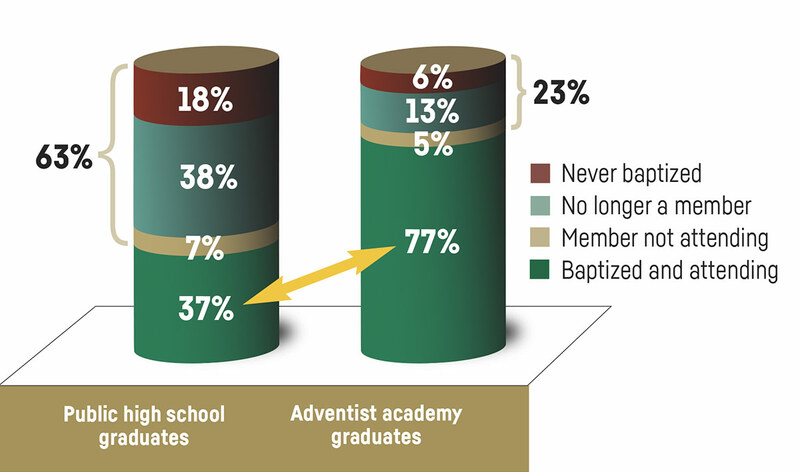 Of those with one or more years of Adventist education, 15.4 percent were never baptized; while in the group with 11 or more years of Adventist education, only 3.1 percent were never baptized (see Figure 1). Another study conducted in 1985 of 807 children and youth from Adventist families in the Lake Union Conference of the North American Division found similar results.8 Of those children and youth with no Adventist education, 38.3 percent never joined the church. In the group with some Adventist education, 4.6 percent never joined the church, while 100 percent of those in the sample who studied all 12 grades in Adventist education joined the church (see Figure 2). While joining the church is foundational, retention is equally important. Sadly, many of those who join the Adventist Church subsequently leave the denomination. Over the past 50 years (1965-2015), for example, there have been 34,385,004 accessions in the Adventist Church worldwide. During the same period, 13,737,205 people left the church.9 This represents a net loss of 39.95 percent. In effect, for every 10 people who joined the church, four have slipped away. We turn now to the matter of the retention of children and youth in the Seventh-day Adventist Church. Over the past three decades, there have been at least seven studies that have examined the role of Adventist education in retention, with three of these studies conducted in the past seven years. Some of these studies have focused on specific regional populations, while others are more global in nature. Some present a snapshot in time, while others have taken a longitudinal approach. While each study has inherent limitations, as is the case with all studies, together they present a picture that is consistent over time and compelling. One of the largest studies was the set of Valuegenesis surveys, conducted over a 20-year period, from 1990 to 2010.13 Valuegenesis1 data from 2,267 12th-grade Adventist students in Adventist schools in the North American Division, for example, showed that the more years of Adventist schooling, the greater the person’s reported loyalty to the Seventh-day Adventist Church, his or her belief in the fundamental teachings of the church, and his or her intention to remain an Adventist at age 40. 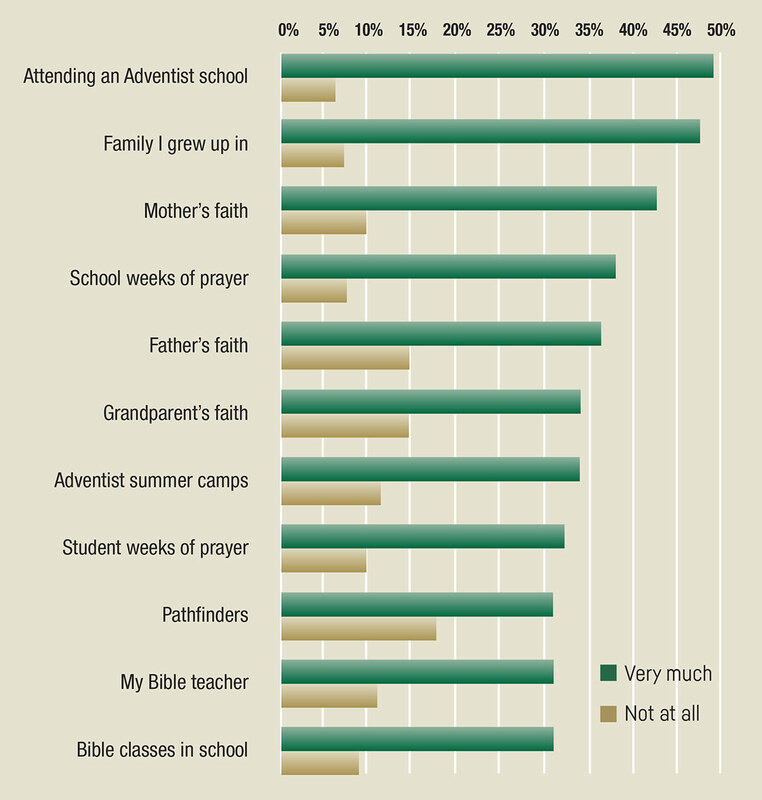 In the 2010 Valuegenesis3 survey, 81 percent of all students indicated that attending an Adventist school was the most important factor that had helped them develop their religious faith, with the Adventist school ranking more highly than any other factor (see Figure 3). Across all three Valuegenesis studies (1990-2010), a full 75 percent of Adventist students in Adventist schools believed that the chances of their remaining in the Adventist Church at age 40 were good to excellent. We have noted the Youth Retention study, which endeavored to follow high school students for 10 years, utilizing a sample about evenly divided between students in Adventist schools and in non-Adventist schools in the U.S. and Canada. One of the key findings of this research was that the number of years in an Adventist school was positively related to commitment to Jesus Christ and to commitment to personal Bible study, as well as to the statements “My relationship with Christ is stronger now” and “Religion is important in my life.”14 Furthermore, intention to marry an Adventist in students who attended an Adventist school was nearly twice the proportion of those who had not attended an Adventist school (83 percent vs. 46 percent, respectively). 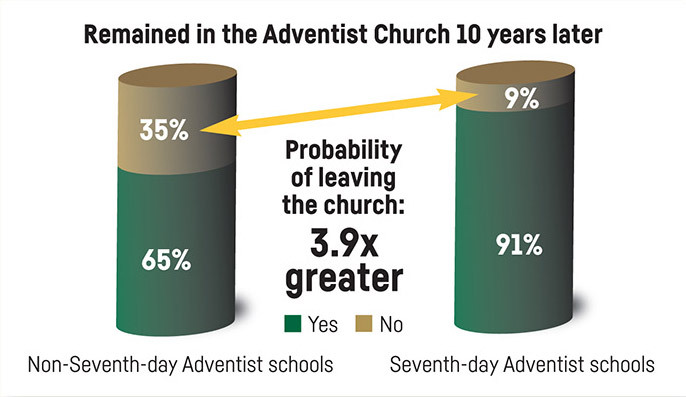 At the 10-year mark, the probability of leaving the Adventist Church was 3.9 times greater for those who had attended non-Adventist schools, compared to those who had attended Seventh-day Adventist schools (see Figure 4). Warren Minder’s study, conducted in the Lake Union Conference, also considered retention, identifying those who joined and remained, and those who joined but subsequently left the church.19 In sum, only 50.8 percent of those youth from Adventist families who had not experienced Adventist education joined and remained in the church, compared to 98.2 percent of those who had studied all 12 grades in Adventist schools (see Figure 7). The Center for Creative Ministry recently conducted a global qualitative study in which 925 former or inactive church members were interviewed. Findings indicate that only 17 percent of lapsed and ex-members had received any form of Adventist education, compared to 56 percent of those who were current members.20 This threefold difference provides evidence that those who have not experienced Adventist education are disproportionately more likely to become inactive or leave (see Figure 8). The study concluded that one of the greatest retention issues for the Adventist Church relates to young adults rising into the middle class. These were individuals who joined the church when they were younger and had less education. As their education, predominantly in non-Adventist institutions, progressed, however, they quit attending regularly and eventually left the Adventist Church. 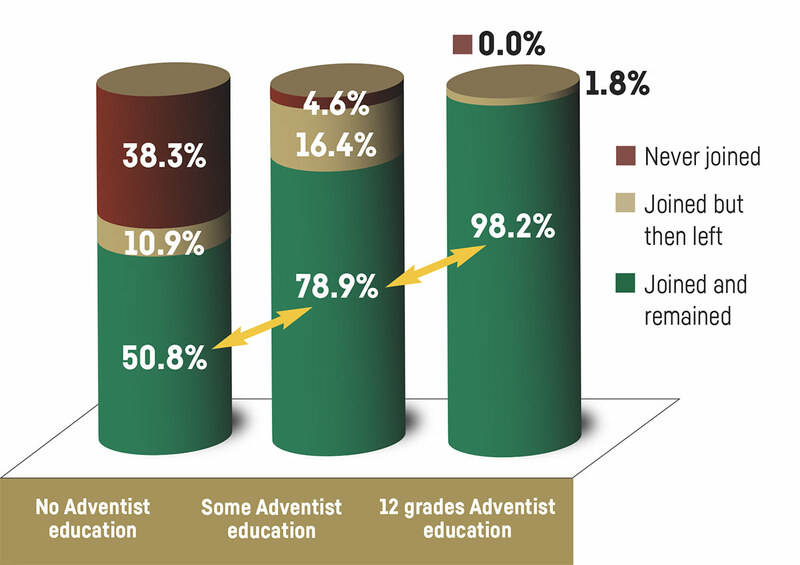 Global studies conducted by the General Conference Office of Archives, Statistics, and Research in 2013 and 2014 have also revealed key differences between ex-members and current members in terms of the proportion who have attended Adventist schools.21 Current members were twice as likely to have Seventh-day Adventist tertiary education compared to ex-members who had studied at the tertiary level. Current members who had secondary education as their highest education were 2.5 times as likely to have studied in an Adventist school, compared to ex-members who had secondary education as their highest level of studies. Finally, current members who had elementary education as their highest education were three times as likely to have studied in an Adventist elementary school, compared to ex-members who had elementary education as their highest level of studies (see Figure 9). This may suggest that early Adventist education is an especially powerful factor in retention. In essence, Adventist education is mission. Through Adventist education, children and youth experience accession and retention, for the ultimate purpose of redemption (see Figure 10). Consequently, the Seventh-day Adventist Church must reaffirm and uplift the central role of Adventist education in the evangelistic mission of the church. The prophet Isaiah wrote: “All your children shall be taught by the Lord, and great shall be the peace of your children.”23 The Hebrew word translated “peace” in this passage is shâlôm. While shâlôm does include the concept of peace, it incorporates much more—safety, well-being, health, prosperity, and happiness. Shâlôm is what we want for our children and youth. There is a condition, however. In order to experience shâlôm, our children and youth must be taught by God. Taught by God. Through Seventh-day Adventist education. Pan-African LEAD Conference in Kigali, Rwanda, February 15-19, 2017. John Wesley Taylor V, EdD, PhD, serves as an Associate Director of Education in the General Conference Department of Education in Silver Spring, Maryland, U.S.A. His grandfather, John Wesley Taylor III, joined the Seventh-day Adventist Church while attending an Adventist academy, and later, as a physician, served as a missionary in South America and in Inter-America. Since that time, three generations have been educated in Adventist schools, have remained in the Adventist Church, and together have provided more than a century of service to the church. Ellen G. White, Fundamentals of Christian Education (Nashville, Tenn.: Southern Publishing, 1923), 436. CognitiveGenesis was a longitudinal study conducted from 2006 to 2009, involving more than 800 Adventist schools in the United States, Canada, and Bermuda, with approximately 52,000 participating students in grades 3-9 and grade 11. Standardized achievement test results indicated that students in Adventist schools in the U.S. outperformed the national average in all subjects; for all grade levels, school sizes, and ethnic groups; and regardless of ability level. Furthermore, the more years a student attended an Adventist school, the greater the improvement in performance. This “Adventist advantage” in education became the subject of a PBS documentary The Blueprint by award-winning producer Martin Doblmeier. Further information on the CognitiveGenesis study may be found in “CognitiveGenesis (CG): Assessing Academic Achievement and Cognitive Ability in Adventist Schools,” Journal of Research on Christian Education 21:2 (2012): 99-115 by J. Thayer and E. Kido. A summary is also available at http://adventisteducation.org/assessment/cognitive_genesis/overview. Matthew 3:6, 11; 28:19; Mark 1:5; 16:16; Luke 3:3; Acts 2:38, 41; 8:12-13, 36-38; 13:24; 16:31-33; 18:8. Unless otherwise indicated, all Scripture quotations in this article are taken from the New International Version (NIV). Holy Bible, New International Version®, NIV® Copyright © 1973, 1978, 1984, 2011 by Biblica, Inc.® Used by permission. All rights reserved worldwide. “School Days Around the World”: https://norberthaupt.com/2012/04/20/school-days-around-the-world/; “School Days Around the World” (June 2015) Infographic: http://elearninginfographics.com/school-days-around-world-infographic/. Total number of hours in school can range from 15,200 in Finland to 37,400 in China, which holds the record for both highest number of hours per day and highest number of days per year, at 9 and 260 respectively. General Conference Office of Archives, Statistics, and Research, 2016 Annual Statistical Report: 152nd Report of the General Conference of Seventh-day Adventists® for 2015: http://documents.adventistarchives.org/Statistics/ASR/ASR2016.pdf. Statistics provided by the Department of Education, General Conference of Seventh-day Adventists. Kenneth James Epperson, The Relationship of Seventh-day Adventist School Attendance to Seventh-day Adventist Church Membership in the Southern Union Conference. EdD dissertation, Loma Linda University, 1990. In this study, 300 family units were randomly selected from the Southern Union Conference of the North American Division, and 210 families responded, representing a return rate of 70 percent. 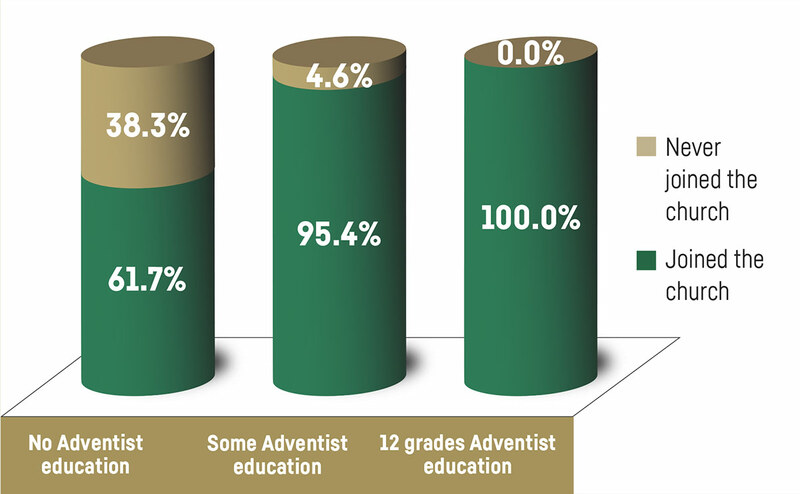 Of the individuals in the study, 40 percent had never attended an Adventist school. Children and youth from Adventist families who were baptized into the Adventist Church had attended an Adventist school for 8.06 years on average, while those children and youth who were never baptized into the Adventist Church had attended Adventist schools for an average of only 2.42 years, yielding a significant relationship (p<0.000) between the number of years in Adventist schools and baptism. The study also indicated that of those who were baptized, 2.6 percent were baptized prior to the age of 8 years old, 63.7 percent were baptized between the ages of 8 and 15, while 14.2 percent were baptized between the ages of 16-23. The 7th grade was the most frequent grade level at which children were baptized, with 61.0 percent of those baptized having been baptized between grades 5 and 8. Warren E. Minder, A Study of the Relationship Between Church-sponsored K-12 Education and Church Membership in the Seventh-day Adventist Church. EdD dissertation, Western Michigan University, 1985. In this study, 400 family units were randomly selected from the Lake Union Conference in the North American Division. The study reported a return rate of 71.8 percent and a sampling error of approximately 3.25 percent. The study found a significant relationship (p<.001) between the number of years in grades 1 to 12 that a person attended an Adventist school and whether or not the person was baptized into the Seventh-day Adventist Church. There was also a significant relationship (p<.001) between the church membership of each parent and baptism of the child, as well as between parental active involvement in the church and baptism of the child (p=.0011 for the mother; p=.0191 for the father). Minder also cited results from an earlier study, “A Study of Seventh-day Adventist Church Members,” conducted in the Pacific Union Conference in 1962 (N=83,662; 68 percent return rate). That study reported that for young people who had attended all 12 grades at an Adventist school, 97 percent had joined the church, as opposed to 32 percent of the young people from Adventist families who did not attend any Adventist school during elementary and secondary schooling. Further, it was reported that in the group that had received some K-12 schooling in Adventist schools, 57 percent joined the church. 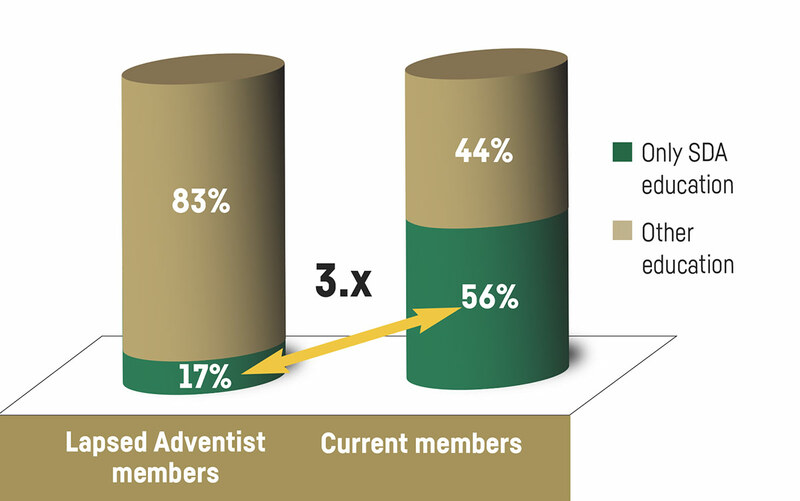 Figures provided by the Secretariat of the General Conference of Seventh-day Adventists. Jeremiah 13:20 (CEB). Copyright © 2011 by Common English Bible. Roger L. Dudley and V. Bailey Gillespie, Valuegenesis1: Faith in the Balance (Riverside, Calif.: La Sierra University Press, 1992); Roger L. Dudley and Janet Leigh Kangas, “Valuegenesis1: How Does Adventist Education Affect Youth Attitudes?” The Journal of Adventist Education 52:4 (April-May 1990): 24-29, 45, 46; Jerome Thayer, “The Impact of Adventist Schools on Students.” Paper presented at the 4th Symposium on the Bible and Adventist Scholarship, Riviera Maya, Estado Quintana Roo, Mexico, March 16-22, 2008: http://fae.adventist.org/essays/iv_Thayer_Jerry.pdf. The Valuegenesis1 survey (1990) received responses from 10,641 Adventist students in Adventist schools and 457 Adventist students in non-Adventist schools in North America. Thayer subsequently analyzed a sub-sample consisting of 2,267 12th grade Adventist students in Adventist schools. The report of a replication of the Valuegenesis1 survey in the South Pacific Division in 1993 is available at http://circle.adventist.org/files/download/VGCORERE.pdf. A further replication of the Valuegenesis1 survey was conducted in Puerto Rico in 1995, with reports available at http://digitalcommons.andrews.edu/cgi/viewcontent.... and http://digitalcommons.andrews.edu/cgi/viewcontent.cgi?article=1468&context=dissertations. See V. Bailey Gillespie, Michael J. Donahue, Ed Boyatt, and Barry Gane, Ten Years Later: A Study of Two Generations (Riverside, Calif.: La Sierra University Press, 2003); and V. Bailey Gillespie, “Valuegenesis2: Adventist Schools Do Make a Difference,” The Journal of Adventist Education 65:1 (October/November 2002): 12-16. More than 16,000 Adventist students in grades 6 through 12 completed the second Valuegenesis questionnaire. The Valuegenesis3 survey (2010) received responses from more than 18,000 students in grades 6 through 12 in Adventist schools throughout North America (Bailey Gillespie, “Valuegenesis3 Update: Research Information Summary,” Issues 1-5. Published by the John Hancock Center for Youth and Family Ministry, Riverside, California). Roger L. Dudley, “Understanding the Spiritual Development and the Faith Experience of College and University Students on Christian Campuses,” Journal of Research on Christian Education 8:1 (Spring 1999): 5-28; __________. “Youth Religious Commitment Over Time: A Longitudinal Study of Retention,” Review of Religious Research, 41:1 (1999): 110-121; __________, “Christian Education and Youth Retention in the SDA Church,” The Journal of Adventist Education 62:3 (February/March 2000): 8-13; __________, Why Our Teenagers Leave the Church: Personal Stories From a 10-year Study (Hagerstown, Md. 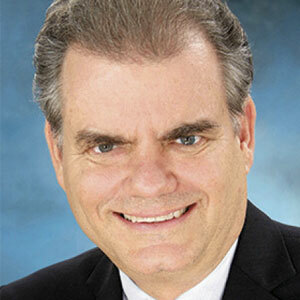 : Review and Herald, 2000); Jerome Thayer, “The Impact of Adventist Schools on Students” (Unpublished paper, 2008). This paper included a re-analysis of the Youth Retention Study data. The Youth Retention study (Roger Dudley) began in 1988 with 1,523 baptized Adventist youth ages 15 and 16 in the United States and Canada. These individuals were surveyed each year in order to determine what factors were related to staying or leaving the church. When the study ended 10 years later, 783 (51.4 percent) of the original group, now young adults, completed the survey. Dudley speculated that many of the young people who dropped out of the study were no longer church members. Kenneth James Epperson, The Relationship of Seventh-day Adventist School Attendance to Seventh-day Adventist Church Membership in the Southern Union Conference. EdD dissertation, Loma Linda University, 1990. Further analysis yielded a positive relationship (p<0.021) between Adventist school attendance and regular attendance at a Seventh-day Adventist church. Epperson also reported that children who had both parents as members of the Adventist Church averaged an attendance of 8.4 years in Adventist schools, compared to 1.19 years when only one parent was a member of the Adventist Church, representing a significant difference (p<0.000). For 53.6 percent of those who no longer regularly attended an Adventist church, neither parent was a member of the church. Paul Richardson, “Survey of Former and Inactive Adventist Church Members.” Center for Creative Ministry, Milton Freewater, Oregon, 2013: https://www.adventistarchives.org/2013-retention-study.pdf. Robert W. Rice, A Survey of the Relationship Between Attending Seventh-day Adventist Academies 9-12 and Subsequent Commitment to the Seventh-day Adventist Church. PhD dissertation, University of Denver, 1990. There were 264 participants in the North American Division study, representing a 70 percent return rate (65 percent for the public high school graduates and 75 percent for the Adventist academy graduates). In the study, 93 percent of those who graduated from an Adventist academy had spent the 9th grade in an Adventist school, whereas only 71 percent of those from Adventist families who graduated from a public school had spent the 9th grade in a public school. These statistics may indicate a tendency for certain Adventist families, whose children may begin high school in an Adventist academy, to shift enrollment to a public high school at some point during secondary education. Data from the Youth Retention study yielded complementary findings in regard to tithe paying. Warren E. Minder, A Study of the Relationship Between Church-sponsored K-12 Education and Church Membership in the Seventh-day Adventist Church. EdD dissertation, Western Michigan University, 1985. In the sample (N=807), 215 individuals (26.6 percent) were not Seventh-day Adventists. This group was comprised of 138 individuals (64.2 percent) from Illinois, Indiana, Michigan, and Wisconsin, who had never joined the church and 77 individuals (35.8 percent) who left the church after joining. The study found a strong positive relationship (p<.001) between Adventist schooling and church retention, wherein increased years of Adventist schooling were associated with an increased probability of the person remaining in the church. Paul Richardson, “Survey of Former and Inactive Adventist Church Members.” ASTR Publication produced by the Center for Creative Ministry, 2013. 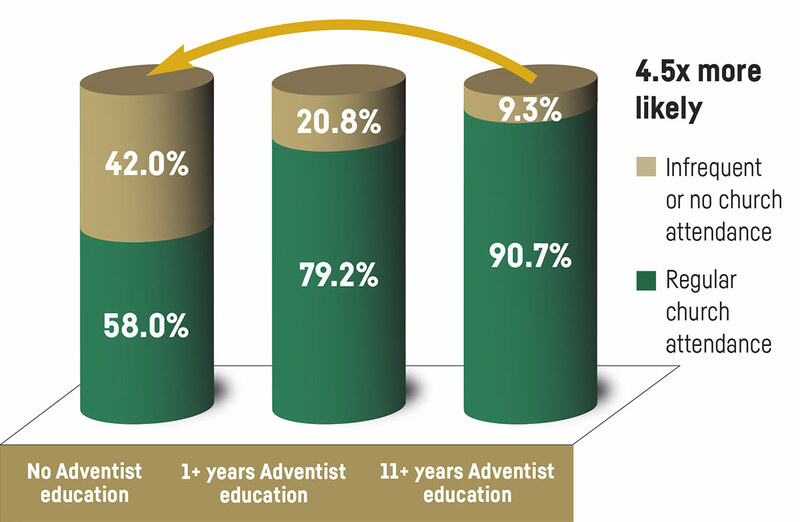 Of the 17 percent of lapsed and ex-Adventists who had attended Adventist schools, 6 percent had attended an Adventist primary or elementary school at some point in their life, 7 percent had attended an Adventist secondary school, and 8 percent had attended an Adventist college or university. Participants were from Africa, South America, Europe, and North America. Data for the school attendance of ex-members are based on the ASTR report “Leaving the Church: Why Some Seventh-day Adventist Members Leave the Church, and Why Some Come Back” (2014), a study which was conducted in all divisions of the church. Data for members are from the ASTR report “Global Church Member Survey” (2013), conducted in 9 out of the 13 world divisions. 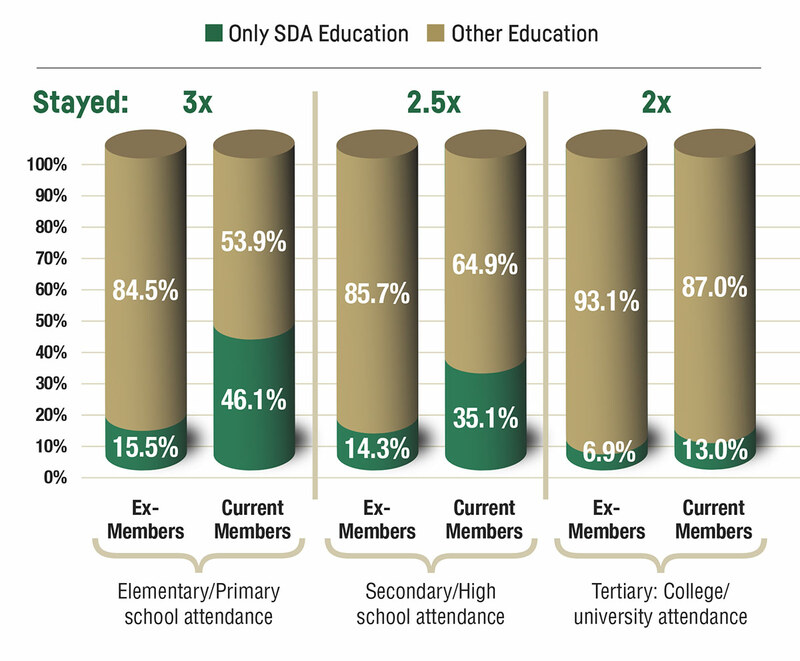 The category “Other Education” for ex-members includes attendance at both Adventist and non-Adventist educational institutions, albeit these percentages were low: 7 percent primary, 7 percent secondary, and 5 percent tertiary (based on data presented by D. J. B. Trim at the LEAD Conference “Educating for Eternity” on October 6, 2016, in Silver Spring, Maryland, U.S.A.). Ellen G. White, Education (Mountain View, Calif.: Pacific Press, 1903), 30. This redemptive purpose perhaps led Ellen White to urge, “There should be schools established wherever there is a church or company of believers” (“Special Testimony to the Battle Creek Church,” , 40). Isaiah 54:13, NKJV. New King James Version®. Copyright © 1982 by Thomas Nelson. Used by permission. All rights reserved.